Europeans would love having the gorgeous 2017 Honda Civic hatchback on the market, the model already being famous on the old continent with the nice design, aerodynamics and driving capabilities. The good news is that, after the car`s official unveiling at the 2016 Paris Motor Show, alongside Civic Sedan and Jazz Spotlight Edition, the model will be offered in Europe as well. 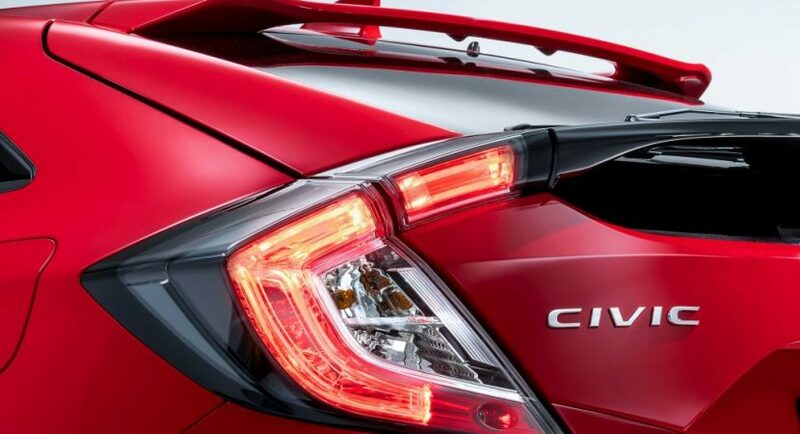 And in order to prepare its arrival on our continent, the Japanese carmaker has released a teaser image, which showcases the car`s taillights. Some might think that the teaser doesn’t fit the décor, as the model was already announced in Europe guise with the same styling features as its sibling in the US. This means that the model will look exactly like the one overseas, with the interior to sport the same highlights and features. The only differences, as expected, might be in the engine department. So far, the carmaker hasn’t given any insights on that matter. However, a while ago, some reports stated that the Euro-spec Honda Civic hatchback would be powered by a 1.0-liter three-cylinder turbocharged engine, closely followed by a 1.5-liter, which is the same one offered on the sedan or the coupe in the US. Otherwise, the Japanese manufacturer will still keep the 1.6-liter i-DTEC engine, also seen on the current model, but coming with some important upgrades that would make it more fuel-efficient and would reduce the CO2 emissions. Once it will arrive next year, the model will be manufactured in the United Kingdom, namely in Swindon, where the carmaker is also said to build the sedan. Even so, the model will not be launched in the UK.